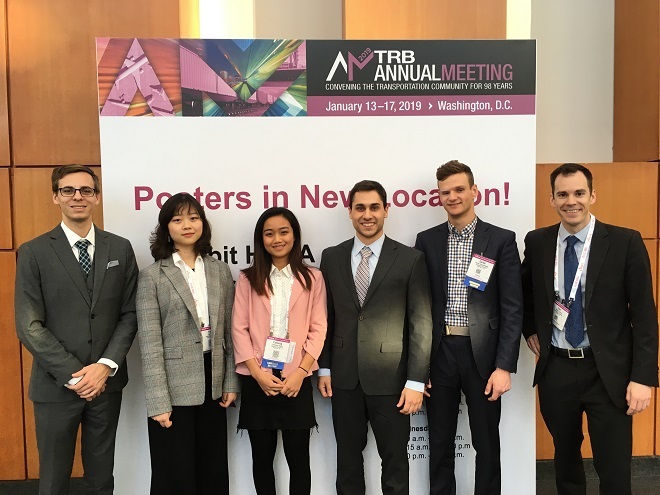 Ph.D. students (l-r) Will Barbour, Yue Hu, Yanbing Wang, Charles Doktycz and Derek Gloudemans with Daniel Work, associate professor of civil and environmental engineering, at the Transportation Research Board Annual Meeting in Washington D.C. in January 2019. Four of the students received 2018 Eisenhower Fellowships. Four engineering Ph.D. students have received prestigious Dwight David Eisenhower Transportation Fellowships, a showing that highlights Vanderbilt’s flourishing position as an epicenter of connected cities and transit research. The fellows were selected through a competitive process that included university panels and a national selection panel. The awards, up to $30,000 each, are made by the U.S. Department of Transportation’s Federal Highway Administration. The Eisenhower fellows were honored at the recent Transportation Research Board of the National Academies at its annual meeting in Washington D.C.
Will Barbour, civil and environmental engineering, advised by Work. Barbour, who received Eisenhower fellowships in 2016 and 2017 as well, focuses on artificial intelligence solutions for efficient and sustainable railroad operations. He also works on research in smart cities technology, personal mobility and large-scale transportation data. Charles Doktycz, civil and environmental engineering, advised by Mark Abkowitz, professor of civil and environmental engineering. His research involves the risk and resilience of infrastructure systems affected by severe weather. Doktycz, also an Eisenhower Fellow in 2017, uses loss and damage databases to determine vulnerable areas of a community in order to make climate adaptation decisions. Derek Gloudemans, electrical engineering and computer science, advised by Work. His research involves using machine learning methods for detection and classification of faulty components in electric motors. Yanbing Wang, civil and environmental engineering, advised by Work. Her research involves estimation for complex traffic flow that involves multiple mobility services, such as bikes, scooters along with passenger cars. The Eisenhower Transportation Fellowship Program aims to attract the nation’s brightest minds to the field of transportation and advance transportation workforce development. All four students are members of the Vanderbilt Center for Transportation and Operational Resiliency. Barbour, Gloudemans, and Wang also are research assistants at the Vanderbilt Institute for Software Integrated Systems. “The research areas are quite broad, but emphasize areas of strength for Vanderbilt,” said Work, who was an Eisenhower Fellow as a Ph.D. student at University of California-Berkeley. “These include areas like transportation risk, reliability, and resilience analysis and transportation cyber physical systems. Several of the students are also involved in MoveVU, linking their research and transportation challenges facing Nashville as well as Vanderbilt. “Our outstanding students are not just technically strong but they are also emerging leaders interested in improving our community through their research and service,” he said.